"Essaouira has something for everyone, including two brilliant golf courses, golf fans won't be disappointed..."
Essaouira is a small but up and coming tourist destination in Morocco. This is a perfect example of a late 18th century fortified town. Originally a small fishing village, Essaouira retains is fishing heritage and you can witness the spectacle of the fishing boats coming in to harbour at sunset, brimming with fish. 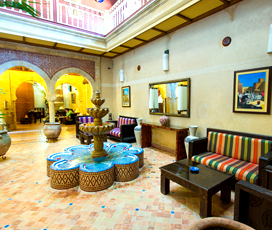 A gorgeous coastal destination, the resort features a UNESCO protected Medina and stunning fortified ramparts. It is a bastion of culture by the Atlantic Sea: a place of hippie art, lovely sandy beaches and colourful lanes. 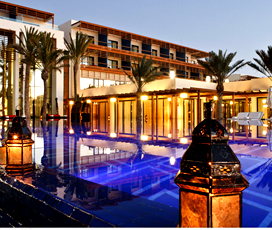 It is less archetypally Moroccan, foregoing the chaos of somewhere like Marrakesh for a more chilled out atmosphere. This makes it perfect for adults and family holiday who want to appreciate all the wonders that it has to offer. A vibrant port city situated on Morocco’s Atlantic Coast, it is blessed with excellent sea winds, making it one of Morocco’s premier watersports locations. The harbour itself is surrounded by a series of 18th century fortifications, that offer spectacular vistas over the sea and surrounding area. Today it is a popular tourist destination due to its golden beaches and white-crested waves, with a population of around 80,000. 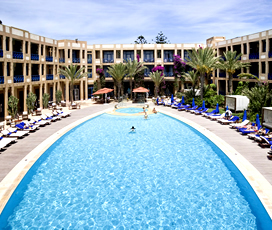 One of the best holiday destinations in Morocco, it is known for its warm climate. It averages just three days of rain between April and October, ensuring that your holiday is virtually guaranteed to be a dry one. This coupled with temperatures that average between 20 degrees in April and 23 degrees in October make it ideal for a beach holiday. The beautiful coast dates back to the 7th century BC and was originally a Phoenician port along a vital trading route. It was also important during Roman times, with a purple dye factory being established there during their rule. Following that it largely reverted to a fishing town for the next 1500 years, until 1764, when it was fortified to support the crucial port of Agadir. These impressive fortifications can still be seen in the town today and have caused a relative boom in its fortunes ever since. As a seaside city it provides the best family activities, as they almost invariably involve the beach in some way. Days spent on Essaouira’s golden sands are an absolute joy and are perfectly complemented by the shallow waters, which are ideal for children. Families could also climb the city’s famous ramparts for a spectacular view over the sea and surrounding area. While the UNESCO rated Medina is a feast of colours that all children will enjoy. The resort is the kind of place where you sit back and relax on its soft golden sands and take a refreshing dip in its calm blue waters. Its fortified Medina is steeped in history and has been awarded UNESCO World Heritage status, making it a must for anyone who loves to sightsee. Inside it is the famous Place Moulay Hassan, where locals and tourists mill about, and you can soak up the rich atmosphere. Other places of note include the spectacular ramparts that surround the city and the Galerie d'Art Damgaard, which displays art work by local artists. The majority of Essaouira’s nightlife is centred around the beach and beachfront area with a smattering of bars and clubs, offering visitors the chance to drink and dance the night away. 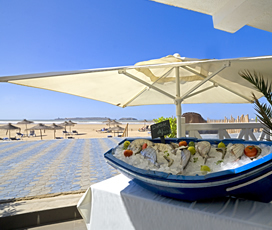 There are also plenty of traditional Moroccan restaurants overlooking the blue waters of the Atlantic, ensuring that there is something for everyone in this incredible coastal town. Essaouira tends to take a more western approach than many of the other cities in Morocco, with fewer souks and haggling, and more traditional display prices. This makes it a great place to buy traditional Moroccan goods, such as ceramics, jewellery and leather work. The city is also a popular haunt of artisan traders and artists, ensuring that there are plenty of high-quality products offered in its meandering streets.